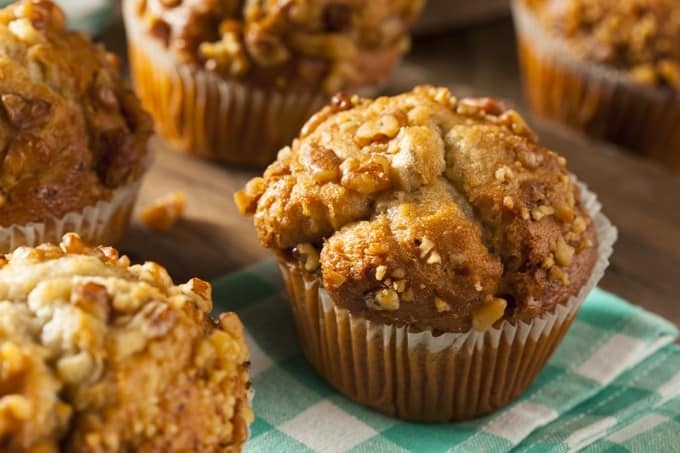 These apple pecan muffins from Ellie Krieger are a winner. With a 5 star rating on the The Food Network how could they miss? Moist and delicious, you’d never guess they were healthy. I first made them years ago when I came across the recipe in Ellie’s first cookbook, The Food You Crave: Luscious Recipes for a Healthy Life (affiliate link). 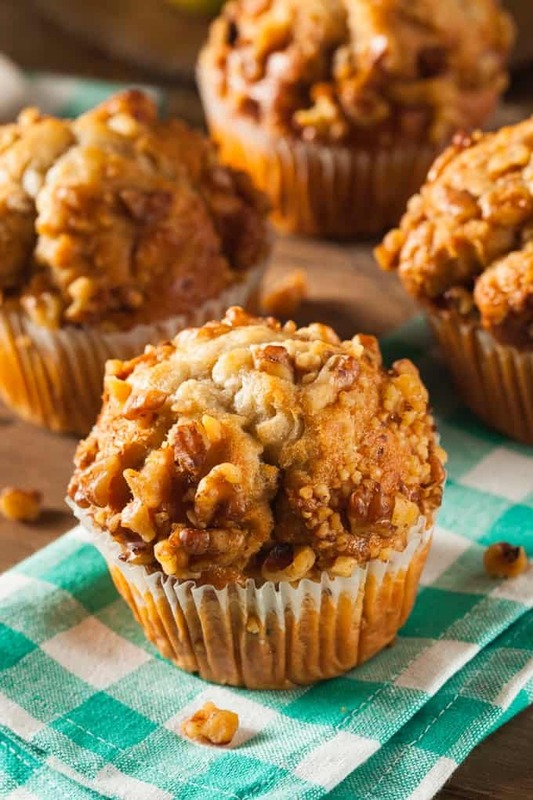 This apple pecan muffin recipe is full of chunks of apple and topped with a delicious crunchy mixture of pecans, cinnamon and sugar. The only change I made was adding 1/2 teaspoon cinnamon to the muffin batter. And I used a Granny Smith apple instead of yellow delicious, since it’s what I had in the fridge. Feel free to substitute walnuts for the pecans if you like. It’s a delightful way to begin your day, with a cup of Greek yogurt or hard boiled egg. According to my calculations each muffin has just 213 calories, *6 Weight Watchers PointsPlus, *7 WW Freestyle SmartPoints. If you’ve made these apple pecan muffins, please give the recipe a star rating below and leave a comment letting me know how you liked them. 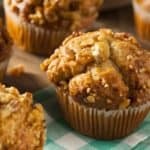 This lighter healthier apple pecan muffin recipe, slightly adapted from Ellie Krieger, is light, tender and delicious. Position an oven rack in the middle and preheat the oven to 400F degrees. Coat a standard (2-12-inch) 12-cup muffin pan with cooking spray. In a small bowl mix together topping ingredients and set aside. Whisk together flours, baking soda, cinnamon and salt in a medium bowl and set aside. Whisk the sugar, oil, eggs, applesauce, vanilla, and buttermilk in a large bowl until well combined. Stir the flour mixture into the liquid mixture just until combined. Gently stir in apple chunks. Divide the batter equally among the muffin cups. (I like to use an OXO Good Grips Cookie Scoop ) Sprinkle with nut mixture. Bake until the muffins are lightly browned and a toothpick comes out clean when inserted into the center, about 15-20 minutes. Cool the muffins in the pan for 10 minutes and remove them to a wire rack to cool completely or enjoy while still warm. Source: slightly adapted from The Food You Crave: Luscious Recipes for a Healthy Life (affiliate link) by Ellie Krieger. I’ve never made this particular recipe as a bread in a loaf pan. But in my experience most muffin and quick bread recipes are interchangeable. So, I think it would work fine. I’d bake it at 350 and think it should take between 45 and 60 minutes to bake. Hope this helps. Is there a difference between whole wheat pastry flour and whole bread flour? I have found the bread flour but not pastry. I donna, yes, they are different. Whole wheat pastry flour is softer so it works better in quick breads, cakes, muffins, etc. A good alternative to whole wheat pastry flour is white wheat flour if you can find it. Hope this helps! can you just use all flour if you cant find wheat pastery flour?